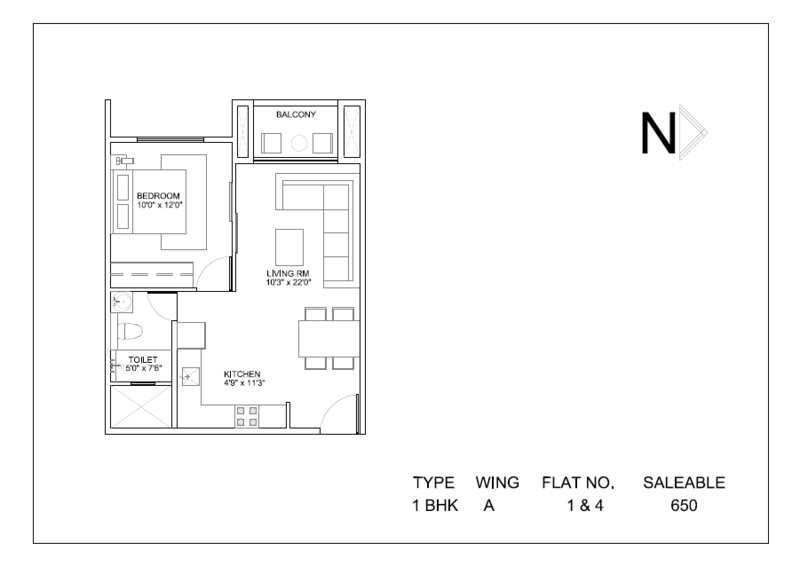 The name’s “Nandani, Hiranandani.” Sold already! That’s the brand value of Hiranandani Glen Classic coming up in Hebbal, North Bangalore by House of Hiranandani. But Hiranandani Glen Classic might sell even faster! When you can own a marquee brand apartment at flexible rates starting from less than Rs 40 lakhs, you know time is at a real. This project offers well designed 1, 2 and 3 BHK smart homes with sizes ranging from 650 to 1820 sqft. It features best world class amenities like Glen Classic comes bundled with the luxuries and value-added features that you expect from the House of Hiranandani, viz. Convenience Store, Badminton Court, Squash Court, covered Swimming Pool, Billiards & Snooker/Pool, Gym with Aerobics, Day Care Center, Landscaping and Water Bodies and many more. 1) Where and what is Hiranandani Glen Classic? Hiranandani Glen Classic is a Residential Development in Hebbal of Bengaluru with single tower, set in 10 acres, having S+18 floors in 3 Blocks with a total of units 288. It is a residential development. It is a strategically located in Hebbal. It has a combination of 1, 2 and 3 Bedroom Apartments to pick and choose from. Along with the premium amenities. No, this project is not of Phased development. Completion of the project would be by 2018. Hebbal Lake is the nearest land mark to the project. Project will have 10 Acres of development area. 10) What is project competition time frame? The project is in the pre launch stage and the completion of the Project will be by 2017. And can move into your home by January 2018. Yes, It is a Vastu Complaint project. Yes, the model flat is ready. One can visit the site to view the model flats. 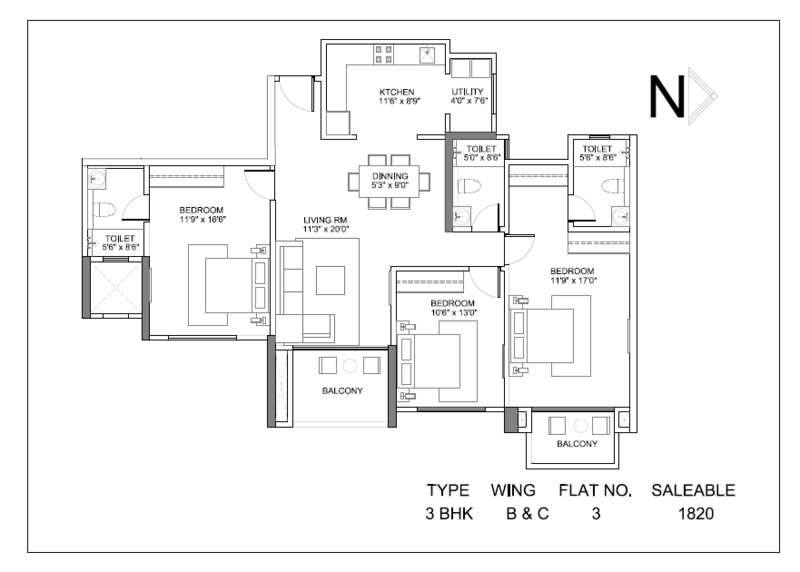 13) What are the different face available of 1, 2, 3 BHK? 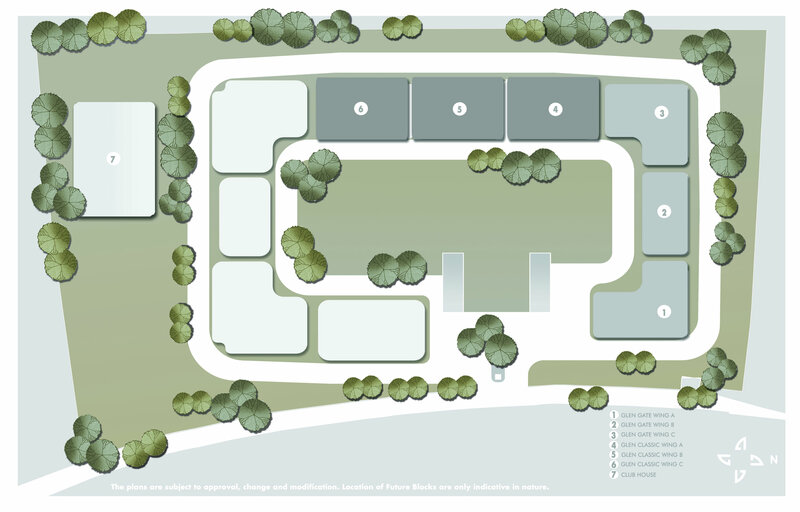 Only 1, 2 and 3 Bedroom units are available in North, East and West facings. The amount to be paid on agreement is 20% of sale value. Premium charges are applicable as per units. Also there will be a floor rise charge of Rs.30 per floor. Yes, the size of the club house is 20,8477 Sft. No, the payment is not time bound. It is construction linked payment. Construction has already started in April 2014 and the expected completion date is December 2017. 19) Which Govt. body has sanctioned the plans? No government bodies have approved the project, the project is awaiting approvals from BBMP and BDA. Approx Rs. 4-5 per sq feet will be collected for the maintenance. Hiranandani will undertake the maintenance for the first year later it is outsourced to others. The current Rate per Sft is 5,9500 and the cost cost during the possession would be Rs.7,000/sft. Project consists of 60% of Open space. Extra amount of Rs.5,00,000 will be charged for additional car parking. The Service tax and the registration cost would be as per govt Norms. It’s ‘A’ khatta BBMP approved. Yes, the occupational certificate will be given at the time of possession. Minor change can be done, but no effect should be done on actual architecture. No, the payment in cash will not be accepted. It would be in Cheque or DD. Compensation delay will be 3% on basic sale value or as per agreement terms. The lock-in period will be two years from date of Launch. The transfer charge to the builder will be 3% on sale value. No, there is no provision for builder buy back scheme. There will not be any cancellation charges before the agreement. Car parking space will be premium and covered, approx 10X10 feet of space. Registration takes place only at the time of possession. Each wing has Four lifts and two additional service lift. Bore well is the source of Water for the project. The upcoming development in the nearby area is Adhara card Data Center. No, They do have a fixed payment mode. The nearest metro station for the project is Hebbal metro station. The first box to tick is location. Hebbal is Bangalore’s newest, hottest buzz, as it boasts of excellent connectivity and access to IT Parks, hospitals, schools, malls, food courts, multiplexes, Ring Roads, Kempe Gowda International Airport, and also to CBD. The location site is a 20 minute drive from the International Airport and just 10 minutes away from the city’s central business district. The apartment offers are in the range of 1, 2 and 3 BHK in a price bucket of around Rs 38 lac to Rs 1.11 crore at the higher end. Possession will be in 2017.The Glen Classic is coming up on a 10-acre plot with S+18 floors in 3 Blocks comprising 288 individual apartments in all. As any long-time real estate watcher will vouch, a Hiranandani offering is for special people or for those who value all the special things in life. True to style, the Glen Classic comes bundled with the luxuries and value-added features that you expect from the House of Hiranandani, viz. Convenience Store, Badminton Court, Squash Court, covered Swimming Pool, Billiards & Snooker/Pool, Gym with Aerobics, Day Care Center, Landscaping and Water Bodies. For the smart generation in particular, the offer gets even better with broadband Internet, video on demand, visitor video message, home automation, and video IP 24/7 surveillance. Hiranandani has continually pioneered newer technologies, bold design and precision engineering to create landmark residential townships and commercial complexes. Propelled by the drive to change expectations and the lifestyle of people thus changing the skyline of the city, Hiranandani has ushered in an era marked by higher standards of living and global lifestyles. With its farsightedness to spot the shifting societal trends, Hiranandani is today a leading real estate group in its flagship business of construction with a pan – India as well as international presence. The Group is known for its projects of Hiranandani Gardens, Powai, Hiranandani Meadows, Thane, Hiranandani Estate, Thane, Hiranandani Business Park Powai & Thane. Buying a house is not like retail therapy. It’s once in a lifetime (or maybe twice). So you might as well make it large! With Hiranandani Glen Classic. Then you can party hard! i have been so confused lately with all the negative comments i have been hearing. when few months ago i went to see sample flat with my parents i really loved that apartment in glenclassic but after some research i came to know about these negative rumors. so i decided to check the once again and ask for each kind of permission required for this township.those officials really helped and where very cooperative. after i was relaxed and confident that my money is going no where. i dont think you should trust these rumors and go check the property through your eyes only then you will know the reality. my father decided to book a 2 bhk an year ago. he loved the sample apartment and decided to book it right away but lately we started to here these negative comments about there housing project. so we right away went to their site to clarify everything and we were really satisfied. the construction is going on as it was supposed to be and hopefully we will get our apartment on time. i have heard all the rumors flying around for house of hiranandani. but honestly it would be better if you go your self and check the site yourself. they have a very big project going on so it is possible that they end up with a little trouble after all you are dealing with india.they have done such a great work in other areas like mumbai and chennai. i think we should trust what we see our self not what others say. the plus point of hebbal is that it is very near to the main city and this is where it becomes complicated. as it is so near to the main city buying a department over here can be a task. we did a hell lot of research and site seeing but we didn’t got anything in our budget finally we decided to visit glen classic and we were surprised to see that there was actually a flat for us just like we wanted and also in our budget. 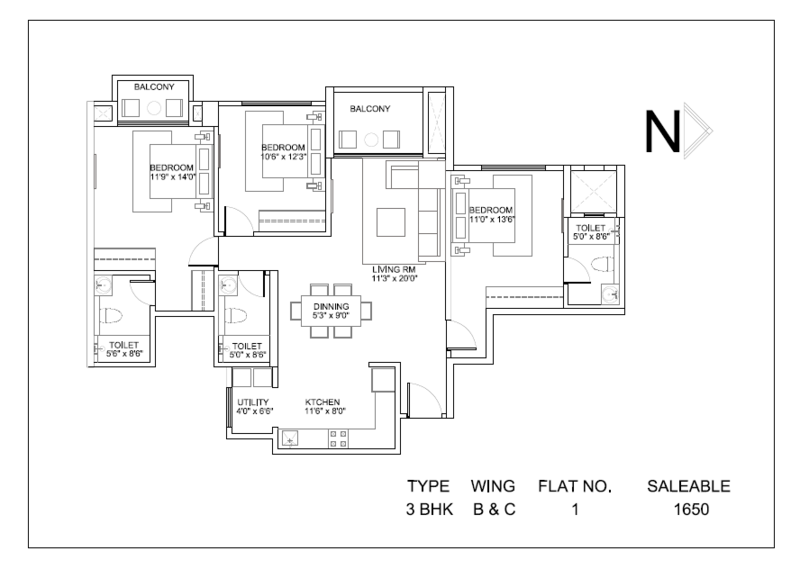 we did some research on House of hiranandani and booked a 2 BHK. hebbal is a beautiful place to stay. it is near to the main city which makes it so accessible. i work in the PSR companies which is near to the hebbal veterinary collage. i wanted a apartment which is near to my work place. as i didn’t wanted to waste most of my time travelling form work to home. at the end of the day you are so tired that you dont get any time to spend with your family. We bought a 2bhk in glen gate. when we first went to see the sample apartment we were not that sure because as we were not hearing good thing about this construction company,But we did our research and decided to invest in this apartment. it has been good so far. Thank god we took the right decision. As per the current real estate scenario in Bangalore, the upscale South and East Bangalore zones have almost reached saturation point with space available for construction of new properties maxed out. Also, the prevailing land and property rates in localities in the South and East zones of Bangalore have reached sky high levels. North Bangalore on the other side is far more reachable. It has well-connected public transportation, modern infrastructure and peaceful atmosphere. I was looking for a luxurious apartment in Hebbal. I found about the Glen Classic project and was really excited to know more about this project as it was from House of Hiranandani. I personally like the location of this project. It is just 20 minutes drive from the International Airport and 10 minutes away from the central business district. I have been considering investing in this project for a year now. I am not sure whether this is the best choice in Hebbal? My initial reasons for selecting this were: Closeness to the beautiful Hebbal lake, the brand recognition across nation, and some very good reviews from friends who have already settled with the brand – although in different cities. My main concern is the actual projection date? 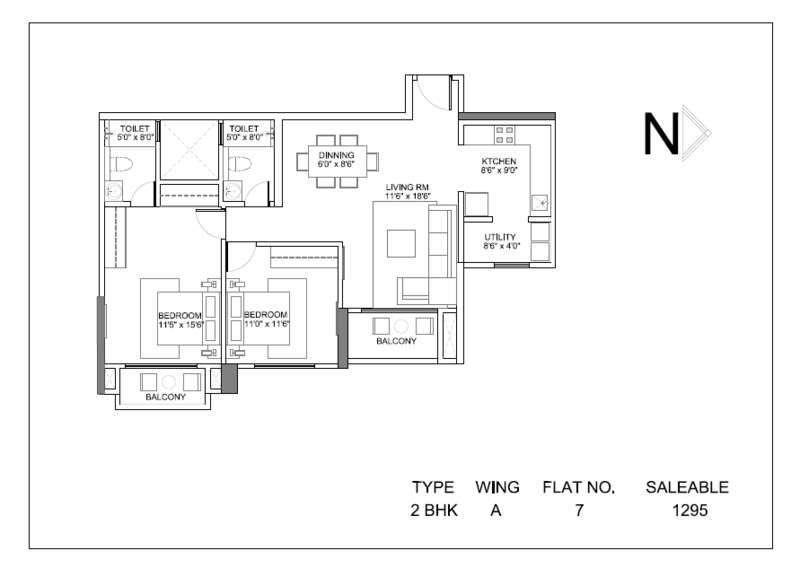 I am looking for a 2 BHK by the end of next year, and nothing beyond that. I guess I should talk to the concerned people at the project and figure it out. was until I got to know about the House of Hiranandani’s Glen Classic project in Bangalore. I’m originally from Nainital, having moved to Bangalore to make a career in the IT world. Though staying far away from home has made me more self-sufficient and independent; I do miss the comforts and tranquility that my native place provided me. And Glen Classic seems to offer me just that. An epitome of functionality and elegance, this property by the House of Hiranandani will provide a stunning view of the Hebbal lake, a wonderful reminder of my beloved Nainital. 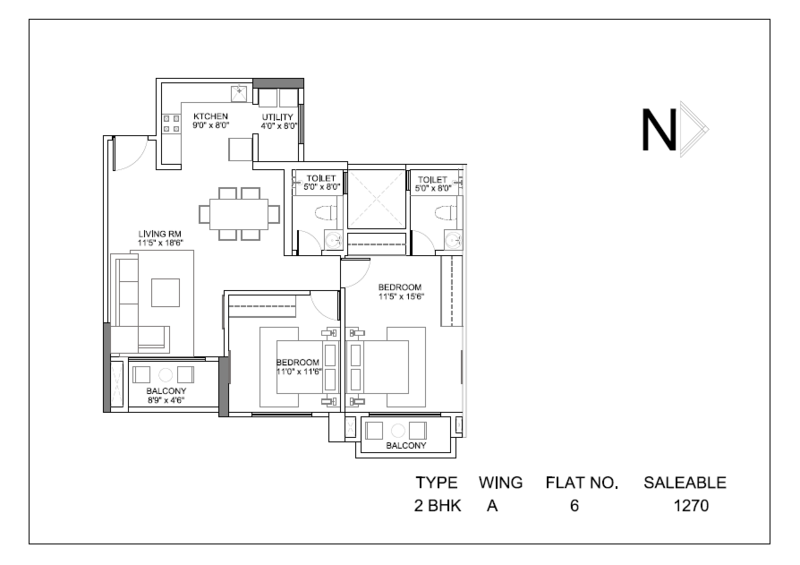 I am looking to invest in a 2 BHK at Glenn classic. This is a good area for future investment and rental income. I came across an advertisement in the newspaper and thought of putting in my hard-earned money in something as beautiful as this one. I booked a 2BHK apartment in August 2011 and the project is near its completion. What I loved about this project is its spectacular view of the Hebbal Lake that surrounds the massive building structure. Swimming pool, billiards and snooker room, gym with aerobics and day care center are some amenities that are offered by the Glen Classic, Hebbal. I am a software engineer and my office is located at the Outer Ring Road. Once this project is ready, I will be really close to my office. I am glad I will save on my traveling time. After extensive research, I booked for an apartment in the Glen classic project by the House of Hiranandani group a few months ago. So I am well versed with the projects around Hebbal area. Glen classic is one of the impressive projects in the Hebbal area and offers 1,2 and 3 BHK constructions. The area surrounding these apartments offer beautiful views of the Hebbal lake. In terms of amenities, the project has premium clubhouse facilities, badminton court, swimming pool, billiards and snooker room, day care center, convenience store, etc. There is also 24/7 video IP surveillance for the security of residents. I have been looking for a good luxury apartment to settle down with my family for a while. My area of choice is Hebbal. Finally, I found one apartment to my liking in the Glen Classic project. These apartments are built in 1, 2, and 3 BHK constructions. I am thinking to book a 3 BHK. The project is close to Hebbal Lake and offers bewitching views of the nearby surroundings. In terms of amenities, the project features clubhouse facilities, badminton court, swimming pool, billiards and snooker room, day care center, convenience store, etc. There is also 24/7 video IP surveillance for the security of residents. Eight years ago when I relocated to Bangalore with my family in a 2 BHK we were 2 brothers and our parents, so 4 people. But now, we brothers are both married and have kids. So we have decided to book a 3 BHK together. Since then our wives have been constantly looking for new projects. We received a lot of recommendations from friends and neighbors too. Finally, decided to book a 3 BHK at Hiranandani’s Glen Classic project. This project has amazing amenities to offer like a gym, squash court, and a swimming pool. We will be booking a flat soon here.